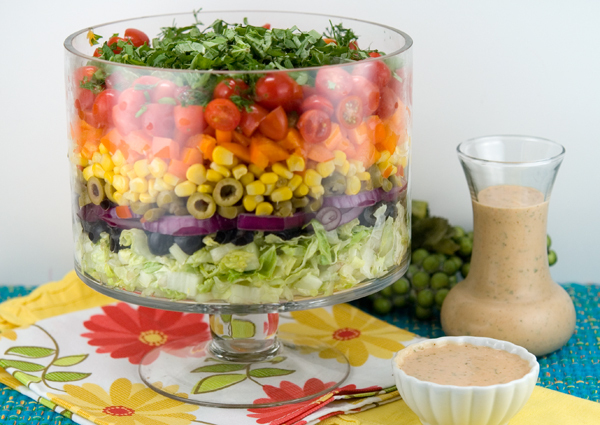 When I saw this great Layer Salad with Creamy Salsa Dressing from the Soup Addict blog, I knew I just had to make it. I was especially drawn to it because the creamy dressing looked pretty healthy, as creamy dressings go. 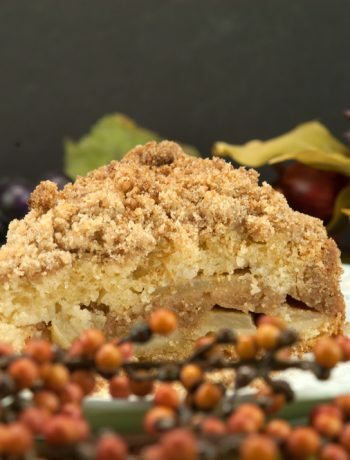 I checked it out in the Calorie Count site, it came out to about 26 calories per serving. I always eat salads with the dressing on the side, especially with creamy dressings. I dip the tip of my fork with salad into the dressing, so you just get a taste of the dressing, but it’s not loaded with it. A dressing is designed to accompany the salad, not the other way around! Although you can’t tell my husband that! 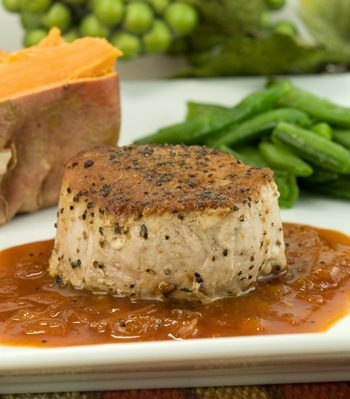 And it’s a bonus when the dressing is lower in fat and calories, and high on flavor! This particular recipe for dressing called for 1/2 tsp. chili powder, but I reduced it to 1/4 tsp and tasted first. I found that was enough for my taste, but you can add another 1/4 teaspoon if you desire. Just add gradually, and taste as you go. I also eliminated the salt, as i thought it was already salty enough for my taste. The dressing was delicious! You can virtually add or delete any ingredient in this salad, you’ll notice no avocado in this salad. I’m not a real fan of them. I filled the center with lettuce, so there would be a good ratio of lettuce for the salad. You could virtually make this an Italian Salad also by using fresh mozzarella, tomatoes, basil, Italian olives…even some imported Genoa salami sliced in julienne strips. The sky’s the limit! Make up your ingredients, or use these. Either way, this salad is sure to please and makes a gorgeous presentation! Add all ingredients and blend with a blender or immersion blender, and puree until somewhat smooth. Taste, and add salt if necessary. Set aside (refrigerate if making ahead). 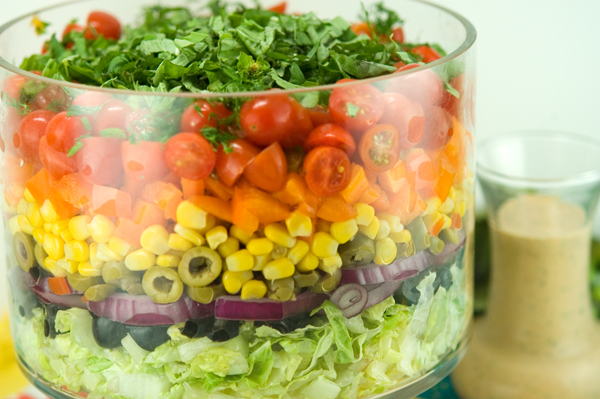 If your bowl is wide, ring your ingredients against the glass and fill the center with romaine lettuce as you build the layers. 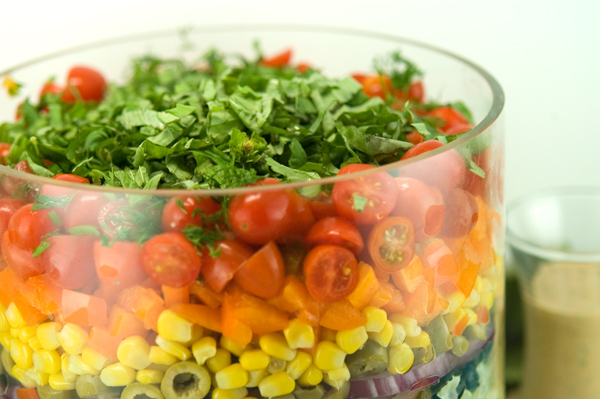 This creates a nice balance of greens to veggies when you spoon down into the bowl. In a medium glass salad bowl (about 90 ounces), spread a thin layer of romaine lettuce. Spoon black beans over the lettuce. Add red onions over the black beans, followed by a layer of olives, then corn, avocados, bell peppers, and top with cherry tomatoes. If you’re not using romaine lettuce to fill the center of the bowl, serve lettuce in a separate bowl tossed lightly with extra virgin olive oil. Any type of lettuce, or a mixture of different varieties can be used in this recipe.